In the latest political news, as a response to the massive protests held by the opposition in early September, the government is blocking any attempt by the opposition to contest the ruling party’s hold on power. Maduro said in early October that governors’ elections to be held in December would be postponed indefinitely in order to focus on mending the crumbling economy. However, it seems fairly obvious that the move reflects a desperate attempt to prevent voters’ discontent inflicting another electoral blow to the government as it did at last year’s legislative elections. Weeks before Maduro’s announcement, the government-controlled National Electoral Council (Consejo Nacional Electoral, CNE) announced tough measures to complete the critical second phase of the recall referendum. The opposition has 21 hours to collect 20% of signatures of the total electorate in each state, rather than in the whole country. The government will offer a limited number of fingerprint reading machines and electoral centers to collect the 4 million signatures from 26-28 of October. Thereafter, the CNE would need to validate the signatures and assign a date for the recall referendum to take place. Under this scenario, the CNE will likely hold the referendum after 10 January, which would guarantee that the ruling party can stay in power until 2019. The tough terms of the recall referendum could cause the opposition to lose momentum against a government that is becoming increasingly defiant and authoritarian. That said, Maduro is attempting to circumvent the opposition-controlled National Assembly to approve the 2017 budget. By doing so the government would prevent the National Assembly from intervening in economic issues or influencing economic policy. There is no end in sight to the ongoing standoff between the opposition and the government, which could fuel greater social unrest and tension in the crisis-struck country. Apart from the latest political news, some economic news has surfaced recently, which is all summarized below. The latest on the OPEC Deal, Oil Prices and Maduro’s bond swap deal. In September, the average price of Venezuela’s mix of crude oil rose 2.0% over the previous month and edged up to USD 38.3 per barrel. This marks the first increase in oil prices after two consecutive months of decline. The monthly increase partly reflects the market reaction to the agreement reached by OPEC countries to limit oil production on 28 September. OPEC countries provisionally agreed to cut output for the first time since 2008. Although the government hailed the agreement, it is unlikely to shore up Venezuela’s crisis-stricken economy in the short-term as output has been steadily declining and oil prices, despite rising slightly in September, are hovering at multi-year lows. Suppliers have scaled back production owing to delayed payments and operational challenges, caused in large part by chronic underinvestment in infrastructure along with poor planning in the oil fields. Though the agreement to cut oil output made in September was of a provisional nature, a final agreement is expected to be reached in November between OPEC and non-OPEC members, such as Russia. Oil-producing countries will define aspects such as country-specific quotas and enforcement mechanisms in order to decrease production from 33.2 million barrels per day (mbpd) to 32.5 mbpd. However, even if November’s meeting proves successful, its ability to influence oil prices looks limited against the backdrop of the global oil glut. To revamp oil production, the government awarded USD 3.2 billion in contracts to drill over 400 wells to increase output by 0.25 mbpd within 30 months. Foreign firms hoping to participate have criticized the lack of transparency and highlighted structural problems, such as limited imports of diluent and lack of funding from state-owned oil company Petroleum of Venezuela (PDVSA) to carry out the projects. The combination of depressed oil prices and falling production has raised concerns over the cash-strapped government’s capacity to meet its international debt obligations. Venezuela’s capability to circumvent a default partly hinges on whether the government and PDVSA will be able to secure an agreement from bondholders for the bond swap proposal presented in September to refinance upcoming debt payments due this year and next. In late September, the Venezuelan government modified the long-awaited bond swap offer it had first presented on 16 September, which had been in the offing for months. Under the revised terms, the government plans to swap USD 5.3 billion in bonds to ease the debt burden of both the Maduro administration and the PDVSA before nearly USD 15.0 billion of bond payments come due in the next 14 months. The bond swap offer was modified to lure more bondholders, offering 50.1% of PDVSA’s U.S. subsidiary Citgo Petroleum Corp. as collateral to make the swap less risky for them. The amount of bonds to be exchanged was reduced to USD 5.3 billion so fewer creditors would have to fight over Citgo’s assets in the case of a default. After the original proposal had proved unappealing, the market reaction was more positive the second time around and PDVSA and Venezuelan bonds rallied to a two-year high. However, PDVSA extended the bond swap deadline in early October from 6 October to 12 October since bondholder participation was below the 50% participation threshold, highlighting a lack of sufficient interest in the swap. Despite the improved swap terms, most analysts remain skeptical about the plan. Using Citgo as collateral is problematic for bondholders because it is PDVSA’s main asset that will be seized if it defaults and creditors would be fighting to claim their part of the collateral. Analysts are struggling to accurately value the assets of Citgo. Current valuations range from zero to nearly USD 10 billion and the company is facing numerous lawsuits for non-payment after the government depleted the firm of funds. Credit rating agency S&P Global Ratings said that even if the swap was successful, it would be considered a formal default since it would be a “distressed exchange” between PDVSA and bondholders since the terms of the swap are detrimental to their interests. The bond swap will not mend the economy’s structural imbalances and will contribute to increasing the country’s debt burden. It is believed to be a measure to buy time in the hope that oil prices will recover to a point where the government can improve the country’s finances. In this month’s LatinFocus Consensus Forecast we expect oil prices to average USD 34.3 per barrel this year, which is up USD 1.0 per barrel over last month’s projection. In 2017, we forecast oil prices rising to USD 45.5 per barrel. The Venezuelan government remains determined to honor its international debt commitments in order to avoid asset seizures and prevent it from losing access to the international financial markets in the midst of a foreign currency crunch in the country. In a context of dwindling international reserves, doing so could however also aggravate scarcity of consumer goods and fuel social unrest in the country. In other news, inflation is still high, car sales are abysmal, and the exchange rate system is still confusing. Given the dearth of official data for just about every economic indicator in Venezuela, different indicators from official and non-official sources are used as proxies to measure the evolution of the economy of the South American country. According to figures from the Venezuelan Center of Documentation and Analysis for Workers (Centro de Documentación y Análisis para los Trabajadores, CENDA), the basic basket of food, goods and services, which is used to measure consumer prices, was 13.6% more expensive in August compared to July and 552% higher than in the same month in 2015. The basic basket of food, goods and services takes into consideration prices of a different set of products than the consumer price index; particularly, the basic basket tracks prices of selected products to cover basic food needs, personal hygiene, living expenses, healthcare, education, clothing and footwear. We estimate that inflation jumped from 368.2% at the end of Q2 to 454.5% at the end of Q3. The latest available data show that the money supply increased by 104.6% in August, marginally up from July’s 99.4% increase. The money supply is expected to keep increasing at an alarmingly fast rate following new reports that show that oil output is declining. Inflation is forecast ending 2016 at 559.7%. For 2017, the we expect inflation of 542.1%. Given the aforementioned limited availability of timely data for the real sector, analysts often use car sales as a proxy for private consumption. Car sales recorded a sharp 83.4% contraction over the same month last year in August, totaling 194 units sold, according to figures from the Venezuelan Automotive Chamber (CAVENEZ, Cámara Automotriz de Venezuela). August’s reading represented a slightly softer contraction than the 86.7% drop recorded in the previous month. In the 12 months up to August, car sales reached just 7,699 units, which is the lowest print on record. August’s result represented a sharp 69.6% decline over the same period last year and the biggest contraction in 18 months (July: -66.5% year-on-year). Car sales currently total just a small fraction of the peak of 491,899 units recorded in calendar year 2007. We expect private consumption to decline 11.1% in 2016, which is down 0.4 percentage points from the previous month’s estimate. In 2017, private consumption projected to contract 4.2%. On the forex front, the bolivar has appreciated somewhat since early March when it crossed the 1,200 VEF per USD threshold and hit an all-time low. The bolivar gained ground against the USD in the second quarter, but experienced some mild volatility thereafter and began to depreciate again in late September. On 7 October, the bolivar traded in the parallel market at 1,093 VEF per USD. The result represented a 6.6% depreciation over the same day of the previous month and a steep 48.5% depreciation over the same day last year. The parallel dollar has lost 31.1% of its value since the start of the year. We see the parallel dollar continuing its downward trajectory this year and project a non-official exchange rate of 1,124 VEF per USD by the end of 2016. In 2017, we expect the non-official exchange rate depreciating further to 1,655 VEF per USD. Meanwhile, the Dipro exchange rate—the first tier of the exchange rate system—remained unchanged at 10.00 VEF per USD on 7 October. According to the government, the Dipro is used exclusively to purchase essential goods such as medicine and food products and can face devaluations when authorities deem it necessary. The free-floating Dicom—the second-tier of the system—has remained broadly stable since early July, after having depreciated continuously since its introduction in March. On 7 October, the Dicom traded at 659.4 VEF per USD. The result represented a 1.8% depreciation over the same day of the previous month. Analysts remain highly skeptical regarding the effectiveness of the new exchange rate system. It is very unlikely that the Dicom will alleviate shortages of goods and services because the government still maintains price controls and there are numerous legal hurdles to imports. In addition, doubts persist about whether the government will commit to a floating exchange rate regime. The government has never allowed any of the three previous exchange rate systems implemented since 2013 to float freely and be set by market forces. 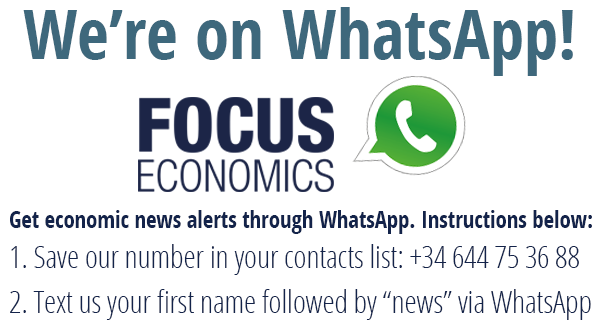 The majority of FocusEconomics analysts expect exchange rate forecasts project that the Venezuelan government will modify the exchange rate system before the year-end. For 2016, five analysts expect the current exchange rate system to remain unchanged, while the remaining six analysts that provided forecasts expect a devaluation in the official exchange rate. By the end of 2017, all analysts foresee a change in the currency exchange rate system. On average, analysts expect the bolivar at the Dipro exchange rate to end this year at 108.4 VEF per USD. Next year, the VEF is expected to trade at 712.1 VEF per USD. Although there has been some very slight positive news for Venezuela in the last month, any way you slice it, economically, politically, socially, it all looks pretty bad for the country and there appears to be no end in sight. 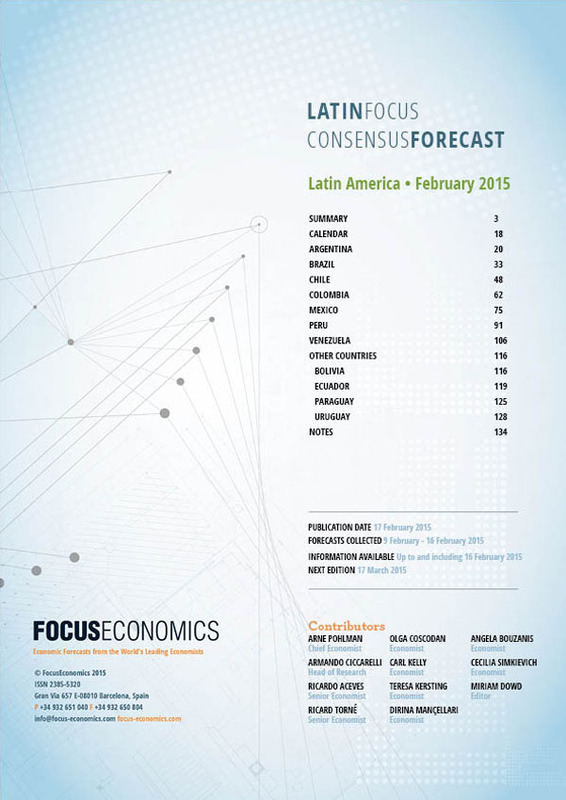 Download a free sample of our LatinFocus Consensus Forecast report to learn more.